Site maps of the model region, such as aerial photographs, topographic maps and satellite imagery, are often useful for gaining a perspective of the dimensions of the model, and for locating important characteristics of the model. Although maps do not contain any specific data used in the calculations, and the presence of a map does not influence the results of the simulation, they are useful for enhancing visualization of the model. Please Note: When a raster image is imported into Visual MODFLOW Flex, the source file is copied and saved in the project’s data repository folder. As such, the original file may be modified, moved or deleted without affecting the imported raster image. •Select Map from the Data Type drop down list. •Next, select the Coordinate System of the image file. If the coordinate system is different than the one defined in the project settings, Visual MODFLOW Flex will perform a geotransformation, converting all coordinates to the project’s coordinate system. All raster images must be georeferenced before importing into Visual MODFLOW Flex. If the selected raster image has already been georeferenced, it will have an associated "world" file, and as such, it will not need to be georeferenced in Visual MODFLOW Flex. Please Note: the world file must have the same filename as the image, and must be located in the same folder as the selected source file, in order for Visual MODFLOW Flex to recognize it. If your source image has a world file, you can skip to the final step. If the source file does not have a world file, you will be prompted to manually georeference the raster image. This procedure is described in the following section. •Zoom In: Click-and-drag the mouse to select the zoom area. •Zoom Out: Zoom out of the image. •Full Extent: Zoom completely out so that the entire image is shown. •Pan: When zoomed in, move the image left, right, up or down. •Add (Control Point): Add a georeference point. See "Adding Georeference Points". •Delete (Control Point): Delete a selected georeference point. •Transform Image: Assigns coordinates to image pixels using the specified control points. 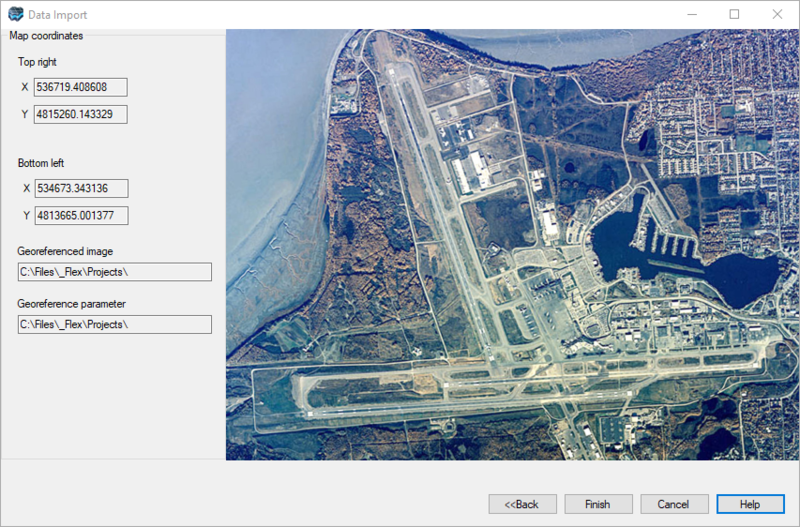 Output Region: This button allows you to save a specified area of the image to the georeferenced file, after the image has been transformed. By default, the output region is the whole image. Click-and-drag a rectangular box on the image to define a new output region, and then click the Save button to save the output region to the georeference file. 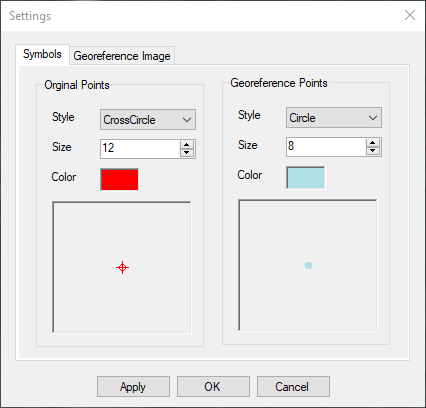 Configure Georeferencing Options: Opens the configure georeferencing options dialog box. For more information on these options, please see "Configure Georeferencing Options" section. Magnification Selector: Select a magnification level from the combo box. The control points table contains the specified control points. You can edit an existing control point by selecting the point from the table, and then clicking the Edit button. A dialog box will display prompting you to modify the control point coordinates. You can also delete a control point from the control points table. To do so, select an existing control point from the grid, and then click the Delete button. The georeference information table displays information about the georeferenced image including the original image file name and path, the original image size, and coordinate type (projected, local or geographic). It also displays information on the transformation such as the degree of rotation, scale X-Y shift, and the output file name path and image size. •From the top toolbar, click on the Add button. •Click on a map location where the world coordinates are known. •A georeference point window will appear prompting for the X and Y world coordinates of the selected location. •Enter the X and Y coordinates for this point. •Repeat this procedure for additional georeference points. •When you set a georeference point, it is added to the Control Points Table. You can improve the accuracy of the georeferencing by adding more than two control points to the image. 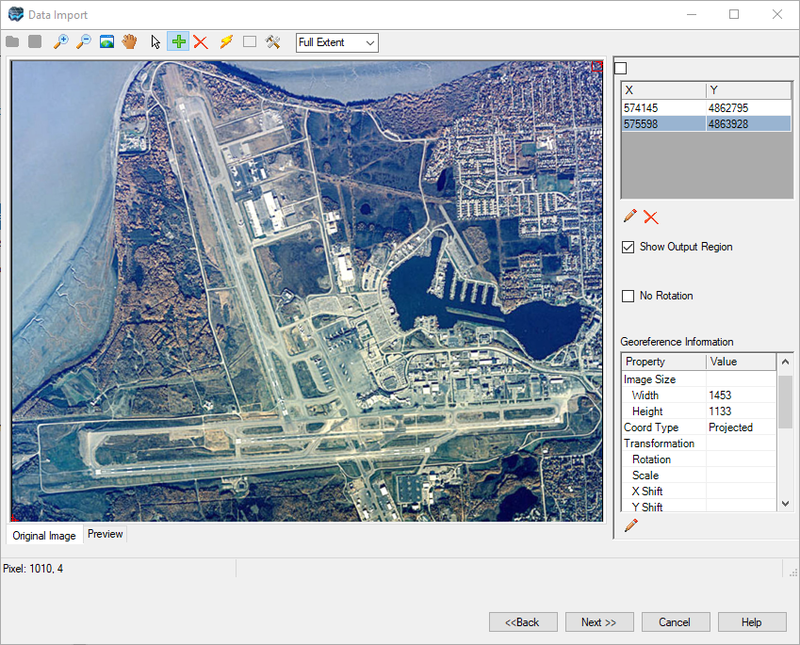 When the image is transformed, the Preview tab will display the original control points and the corresponding georeferenced points, thus allowing you to visualize the accuracy of the georeferencing. Once you have set at least two georeference points, click the Transform button to georeference the image. The georeferenced image will then be displayed in the Preview tab. •Enter the new X and/or Y coordinates for this point. Please Note: You must click the Transform button again in order for the georeferencing to update to reflect the modified X-Y values. •Select the georeference point from the Control Points Table. This tab allows you to change the style settings of the original control points and the georeference points. Choose a Style, symbol Size and Color. A preview of the symbol settings is shown in the boxes below. 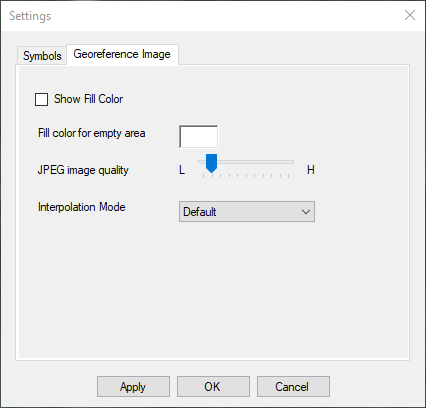 This tab allows you to define settings for the georeferenced image. Each setting is described below. When a georeferenced image is rotated, you can fill the areas of empty space with a specified color. Otherwise, leave the check box unchecked and the empty space will show transparent. Click the color box beside Fill color for empty area to select the color to fill the empty spaces (only if Show Fill Color option is selected). Use the slider to set the JPEG Image Quality. When set closer to L (low), more compression is used in the saved georeference image file, resulting in a smaller file and poorer quality. When set close to H (high), less compression is used in the saved georeferenced image file, resulting in a larger file with better quality. From the Interpolation Mode combo box, specify the interpolation method (algorithm) to use when the image is scaled or rotated The various interpolation methods are briefly described below. Keep in mind, lower-quality interpolation mode will result in a smaller output file, whereas high-quality interpolation modes will result in a larger output file. •Bicubic: Bicubic interpolation. No prefiltering is done. This mode is not suitable for shrinking an image below 25 percent of its original size. •Bilinear: Bilinear interpolation. No prefiltering is done. This mode is not suitable for shrinking an image below 50 percent of its original size. •HighQualityBicubic: High-quality, bicubic interpolation. Prefiltering is performed to ensure high-quality shrinking. This mode produces the highest quality transformed images. •HighQualityBilinear: Specifies high-quality, bilinear interpolation. Prefiltering is performed to ensure high-quality shrinking. The final step involves previewing the raster image and viewing coordinate information, before importing into Visual MODFLOW Flex. The Map Coordinates frame provides the georeferenced coordinates of the Top Right and Bottom Left corners of the image. The path of the georeferenced image, and the associated georeference tag file is also shown. Click the [Finish] button to import the map into Visual MODFLOW Flex.